Prints are available made on heavyweight (225g/m2) watercolour texture paper, using inks which are guaranteed lightfast for 60 years in normal conditions, when mounted behind glass. A3 (41 x 29.5 cm) are priced at £12.00 + carriage at cost, and are an open run of prints, unsigned. A3 prints can be supplied mounted behind a champagne mountboard to fit an off the shelf 50x 40 cm glazed frame. A2 (59 x 41 cm) are priced at £27.00 + carriage at cost, and are a limited edition run of 250 prints which are individually signed and numbered. A2 prints can be supplied mounted behind a champagne mountboard to fit an off the shelf 70 x 50cm. frame. 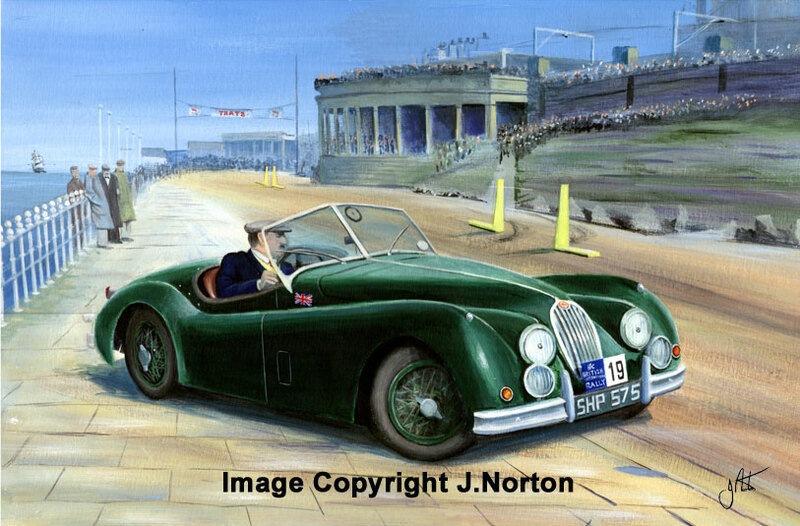 Ronald Adams competes in a test on the Blackpool sea front in the 1956 RAC Rally in his Jaguar XK140. He went on to finish 2nd in the event, co-driven by Ernie McMillen, although the co-driver did not sit in the car on the tests in those days, Ernie watches on by the railings.